Polymer starch-based blends were developed between Starch (St) and Poly(N-Vinyl-2-Pyrrolidone) (PVP). The starch was obtained by extraction from Peruvian yuca (Manihot esculenta), known as sweet corn starch. The films were obtained through the casting method. The thermoplastic starch films were formed through the incorporation of glycerol at 20% wt. The concentrations of PVP incorporated in the polymer blend were equal to 10%, 20%, 30% and 40% (wt). Thus, this work aims to understand the interactions, structure and physical properties of the obtained polymer blend films, including the study of their barrier properties. The films obtained through the St-PVP blends show remarkable improvements upon mechanical and barrier properties, and they represent a highly resistant material with low oxygen permeability. The blends were compatibles between them in the whole range of concentration studied in this work. •	Obtaining compatible polymer blends of thermoplastic Starch (St) and Poly(N-Vinyl-2-Pyrrolidone) (PVP) and developing their films in different ratios. •	The mechanical, thermal and barrier properties of the St films were improved through PVP incorporation inside the starch matrix. Over the past years, the world’s production of plastics has grown steadily. Nowadays, the production of these materials is being estimated to exceed 300 million tons, whereas packaging, considered as the largest market for the plastics industry, represents about the 39.6% of the total demand for plastics. The polymers commonly used in commercial applications are derived from non-renewable sources and are associated with environmental pollution problems . Taking into account the fact that today’s consumers demand higher food quality and environmentally-friendly packaging materials with greater recyclability, there is a significantly growing interest in edible and biodegradable films. These materials are potentially used for food systems, playing the role of barriers to moisture, oxygen, carbon dioxide, lipids, taste and aroma between the food components and the surrounding atmosphere . Thus, over the last few decades, there has been relevant progress in the development of biodegradable packaging materials derived from plant and animal resources, such as polysaccharides, proteins, lipids and their mixtures. These biopolymers have been used to obtain films and coatings for the packaging of high quality food stuffs in order to extend their shelf life and to reduce environmental impact . Among these biopolymers, starch is one of the most abundant natural biodegradable polymers, and it is the main storage product for crops, such as wheat, rice, maize, cassava and potato. This compound is widely used in the food industry as a gelling agent, thickener or preparation of edible films and coatings . In general, these polysaccharide films show adequate optical properties, but poor mechanical characteristics where in the water vapour and oxygen barriers are highly affected by moisture due to their hydrophilicity . As a result of the low mechanical resistance and the high sensitivity to moisture exhibited by starch films, several alternatives have been investigated with the goal of improving their properties, such as blending with other polymers, like polyethylene, polyvinyl alcohol or polylactic acid, as well as reinforcing with nano fillers [6-9]. The effect of additives as well as the use of different starch sources and the control of process parameters on the physical properties have already been reported [10,11]. In this framework, it has been determined that the physicochemical properties of the starch films vary widely depending on the botanical origin of the starch, the content and the type of the plasticizer, as well as the processing conditions . Specifically, cassava starch presents ideal properties for the formation of films because of its ease of preparation, the clarity of paste, the low gelatinization temperature and the good gel stability . Furthermore, cassava starch films have been described as odourless, tasteless, colourless, non-toxic and biodegradable . Previous studies have already formulated cassava starch-based composite films and coatings by combining various other polymers. There are previous reports on blends of starch with poly(N-vinyl-2-pyrrolidone) but are not studies in films [14,15]. PVP has attracted considerable interest due to its hydrophilicity, lubricity, anti-adhesive property and excellent biocompatibility. Furthermore, previous research has already shown that blends of chitosan and PVP can form a homogeneous phase due to the strong hydrogen binding forces between these two kinds of molecules [16,17]. Thus, PVP is proposed in this study as an alternative for the formulation of starch-based material in order to prepare films with improved oxygen barrier properties and mechanical resistance . Finally, the variation of the starch/PVP ratio and the film-forming ability of these polymers were studied for potential applications in food packaging. Sweet native corn starch was obtained from Peruvian yuca (Manihot Esculenta) a tuber which was purchased at a local supplier in Santiago, Chile. Its moisture content was 10% w/w and the amylose percentage was 16%. This last value was determined by the method proposed by Takeda and collaborators . Glycerol (Gly) and Poly(N-Vinyl-2-Pyrrolidone) (PVP) were provided by Sigma Aldrich and their molecular weights were 92,09g/mol and 40,000g/mol, respectively. Films were produced by means of a casting method. Firstly, the sweet native corn Starch (St) was extracted as follows: The sample was washed, peeled and cut into small pieces (1cm3), then mixed with water in a ratio of 1:4 (St/water), and the mixture was ground for 2 minutes. The supernatant was discarded, and the suspension was then dried in a hot-air oven at 40°C for 24hrs. Finally, the starch was crushed and sieved (100μm mesh). For the obtaining of films, the following process was carried out: St was dispersed in aqueous solution under magnetic stirring and heated until reaching 80°C. Gly was added in ratio 1:0.2 with respect to starch. The sweet native corn starch dispersion and PVP solution were prepared at 8% wt. The starch dispersion was heated until reaching 80°C and Gly and PVP were added according to the blend that corresponded. The stirring and temperature of the blend were maintained at 80°C for 20 minutes. The blends were then placed in a centrifuge to remove the bubbles at 3000rpm for 3 minutes and placed onto polystyrene petri dishes and left in an oven at 40°C for 22hrs. The ratios prepared were St-PVP 90-10, 80-20, 70-30 and 60-40. In this work, the abbreviation St represents starch with glycerol (1:0.2). Starch-based films were conditioned at 25°C and 53% Relative Humidity (RH), using a Mg(NO3)2 oversaturated solution for at least 48hrs before every analysis. Starch films containing PVP were named St-PVP10, St-PVP20, St-PVP30, St-PVP40; the number corresponds to the percentage of PVP present in each film. Attenuated Total Reflectance Fourier Transforms Infrared Spectroscopy (ATR-FTIR): Fourier Transform Infrared spectroscopy (FTIR) was used to characterize the films. The films were analyzed in the range from 4000 to 400cm-1, with a resolution of 2cm–1 and 64 scans using a Bruker alpha spectrometer equipped with an attenuated total reflexion diamond crystal accessory (Bruker, Platinium). The spectra analyses were performed using Origin Pro 9.0. Scanning Electron Microscopy (SEM): Ultrathin (50-60nm) sections were cut using a Sorvall MT-IIB ultra-microtome and placed on a cupper grid (300 mesh). Samples were examined using a Scanning Electron Microscope (SEM) JSM-5410 Jeol (Tokyo, Japan) with accelerating voltage at 1.0kV. Images were recorded using a CCD camera Olympus Mega view G2. Differential Scanning Calorimetry (DSC): Thermal properties of the films were determined with a Differential Scanning Calorimeter Mettler Toledo Model DSC mark 822e (Switzerland). Commercial samples of indium (99.999% purity) with a melting point of Tm=156.68°C and a melting enthalpy of ΔHm=38.4Jg-1 were used as calibration standard. Thermo grams were obtained from 25°C to 200°C, cooling to 20°C, and a second heating process to 200°C with a heating rate equal to 10°Cmin-1. Sample weight was about 8-10mg. All these experiments were carried out under purge of dry nitrogen. Glass Transition Temperature (Tg) was determined from the second heating process. Thermogravimetric Analysis (TGA): Thermogravimetric Analysis (TGA) was carried out using a TGA/SDTA 851 Mettler Toledo thermal analyzer (Schwarzenbach, Switzerland). Samples (ca. 9mg) were heated from 20°C to 600°C at 10°Cmin-1 under nitrogen atmosphere (flow rate 50mLmin-1) in order to prevent any thermoxidative degradation. Tensile strength, elongation at break, and modulus of elasticity for each material were measured at room temperature with a Zwick Roell model BDOFB 0.5 TH Tensile Tester, according to ASTM standard method D-882. Strips (10cm × 2.5cm) of films were cut using a die cutter and kept at 25°C and 53% RH for 48hrs before the test. These analyses were carried out with a 1kN load cell. The initial grip separation was 10cm and the crosshead speed used was 50mmmin-1. Results are the average of 12 specimens for each nano composite film. The Oxygen Permeability (OP) of the films was determined at 53% RH and 23°C using an OX-TRAN (Model 2/21ML Mocon Lippke, Neuwied, Germany). The RH value is in agreement with the treatment for starch films [20,21]. The samples were conditioned at the relative humidity level of the test in a desiccator using an Mg(NO3)2 oversaturated solution. Samples were placed in the equipment for analysis, and the transmission values were determined every 20 minutes until reaching the equilibrium condition. The exposure area during the tests was equal to 50cm2 for each sample. The thickness of the film was considered to estimate the oxygen permeability. Analyses were carried out in triplicate for each sample. A randomized experimental design was considered for the experiments. Data analysis was carried out using StatGraphics Plus 5.1. This software was used to implement variance analysis and Fisher’s LSD test. Differences were considered significant at P<0.05. Fourier Transform Infrared Spectroscopy (FT-IR): The FT-IR spectra of the pure components and blends provide additional information, which evidences interactions in different systems with more than one compound, such as polymer blends or nanoparticles contained in a polymer matrix. Specific interactions between components are readily evident through the band displacements, intensity changes, and broadening of the signals, among others [23-27]. Figure 1 shows the spectra of St, PVP and their blends (St-PVP). The spectrum of St shows the characteristic bands, which consider a broad band at 3276cm-1 corresponding to the stretching vibration band of -OH groups. The band at 292cm−1 belongs to the C-H stretching vibration and the bands at 1149, 1079 and 1005cm−1 are bands of C-O stretching vibrations in the anhydroglucose units of starch . The band at 1650cm-1 is typical of water adsorbed in the amorphous regions of starch . On the other hand, the spectrum of the PVP shows representative bands like carbonyl stretching at 1647cm-1 and C-N stretching at 1287cm-1. In all these blends (St-PVP) the presence of the carbonyl band of PVP can be observed, and this is evidence that the blend was successfully prepared. Moreover, there are displacements in the -OH band of starch detected in the samples. The -CO band that belongs to the starch and the -CN band, which corresponds to the PVP, show displacements in blends with regard to pure compounds. This could be due to the strong hydrogen bonding interactions between the functional groups of the components. Scanning Electron Microscopy (SEM): Figure 2 shows the scanning electron microscopy of the cross-section obtained from the starch film and their blends with PVP. From these images, it is possible to observe a remarkable difference between them. Figure 2A presents the cross-section image of the starch film where a smooth surface can be noticed; with few irregularities and that is free of large imperfections. These characteristics are explained by the presence of plasticizer used in the formation of the films. For the film with 10% (wt) of PVP (St-PVP10), the figure 2B shows a homogeneous and smooth surface, although different to the observed one in the St film. The incorporation of PVP in the St matrix changed its structure without a homogeneity modification of the film. The rugosity of the film increases when the incorporation of poly(vinylpyrrolidone) rises to 20% (wt) (St-PVP20). Figure 2C shows a film with larger imperfections and a rugose surface. It is even possible to observe two zones, as apparently there was not a good dispersion of PVP in the starch matrix at this concentration. Figures 2D and 2E show the blends with 30% and 40% (wt) of incorporated PVP, respectively. The SEM images show that the films were more rugose and less homogenous than the starch film. The increase of PVP content in the films leads to production of more heterogeneous films with defects present, and a less pliable aspect than the films with lower PVP content. Thermogravimetric Analysis (TGA) was carried out in order to analyze the thermal stability of the films under study. Figure 3 shows the derivative thermo grams obtained. For the starch film, the decomposition occurred in three stages: The first stage corresponds to water loss in the range of 100-130°C; the second stage is related to the decomposition of the glycerol-rich phase, with the starch also present in this stage, that took place at temperatures close to the range 200-270°C; the third stage occurred at around 330°C, which corresponds to the decomposition temperature of the starch components. These results are in good agreement to those reported in the literature for films based on starch-glycerol [30-32]. The obtained PVP profile shows a single stage of decomposition. The onset temperature was at 380°C, while at 450°C the polymer reached its maximum decomposition. This temperature is coherent with the PVP chemical structure, where the amide groups are capable of forming intermolecular interactions such as hydrogen bonds that cause thermal stability of the polymer . All films under study showed a similar trend, with four stages of decomposition, three of them corresponding to starch and the last one to PVP. The decomposition temperature of blends was generally maintained with regard to their pure components. However, for films with 10% and 20% of PVP (St-PVP10 and St-PVP20), the PVP decomposition took place at 434°C and at 444°C, respectively. This decrease could be explained by the interactions between starch and PVP chains, as in these levels of poly(vinylpyrrolidone) concentrations there is a higher contact between starch and PVP and therefore the auto-associations between PVP chains are getting reduced. In order to investigate the miscibility of starch and PVP blends, the samples were assessed by means of DSC analysis. The presence of a single glass transition Temperature (Tg) in a material constituted by two or more polymers is the main criterion of miscibility [24,34-37]. Transparent films were obtained suggesting that phase separation should not be occurring. The reported data are coming from a second heating cycle. Table 1 shows the values of Tg from all the studied samples. The Tg for PVP was observed at 151°C. Especially in this analysis, the main focus is the variation of the Tg value from PVP in the analyzed blends. The Tg values obtained from starch-based blends showed that the Tg values are not the same as those of pure PVP. This fact indicates the blends compatibility for the whole range of the studied compositions. This can be seen in table 1, where it shows that for samples containing PVP, the Tg values were lower than the values for those of pure PVP. This decrease could be justified by the specific interactions between starch and PVP chains. These intermolecular interactions break the auto-association in PVP chains improving the chain mobility, which generates Tg reduction in the studied blends. The results of mechanical tests of starch-based films are reported in table 1. From these results, it is possible to observe that the incorporation of PVP into the St matrix changed the mechanical properties of the starch. This fact can be detected not only by the young’s modulus increase and the tensile strength values, but also by the decrease of elongation at break values. The increase in the young´s modulus and tensile strength values indicate that the mechanical resistance of the films increases along with the incorporation of PVP in the starch matrix. This behavior is associated to the intermolecular interaction between starch and PVP because of the hydrogen bonding of OH groups from starch and C=O groups from PVP. This strong association has resulted in a decrease in the local mobility of the chemical groups involved in the interaction with the hydrogen bonding, which generates rigidity in the final material. This conduct has been previously reported in literature , with the incorporation of PVP into pectin matrix where an increase of the mechanical resistance in the final film was observed. 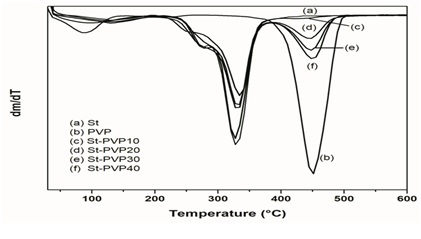 Furthermore, from the results reported in table 1, it can be seen that the St-PVP film flexibility, in all possible studied ratios, changed through the decrease of the elongation at break values with regard to the starch film value. The high value in this parameter for starch film is due to water content in the starch structure, where the water plays the role of a plasticizer agent, breaking the interaction between amylose and amylopectin chains and thus improving the mobility of polymer chains. In this way, the low flexibility values in the films containing PVP could be explained due to the molecules of water in PVP chains. Table 2 shows the oxygen permeability values obtained for the films prepared in this work. The films were measured at 23°C and 53% RH and the thickness of these samples was ranged from 240 to 280μm. The permeability was expressed in (cm2m-2day-1) units. In the performance of the film regarding OP value, certain factors, such as chemical structure, free volume, crystallinity, cross linking, polarity or the preparation method of the film, are involved. The OP value for St film is 38.0 (cm2m-2day-1), a value that is in agreement with previous works [20,38,39]. Table 2 shows the incorporation of PVP in a whole range of concentrations studied into the St matrix, where a drastic decrease in the oxygen permeability values can be observed. In this sense, the results show agreement with studies where the films based on biopolymers has generally a lower OP in comparison to synthetic films [40-43]. For the St-PVP30 film it is observed an increase in the OP value regarding the other films, this could be due to defects in the final material, since the general trend is that as increase PVP in the film the OP value decreased. The decrease of OP values can be explained by the nature of the polymer incorporated into the St matrix. The PVP is a hydrophilic polymer, therefore the film formed has a marked polar trend and consequently, regarding these characteristics, the transfer of oxygen molecules into the film seems to be limited. Furthermore, the generated cross linking, due to the interactions between starch and PVP, mainly through hydrogen bonding, and previously verified through FT-IR analysis, had resulted in an increase of the cohesive energy density of the final material. This last one causes a decrease in oxygen permeability values, which means that the incorporation of PVP, in any concentration under study, improved the starch film oxygen permeability . The swelling kinetics and solubility studies of the materials are an important tool in the characterization of the level of incorporation of PVP in St matrix [22,45]. 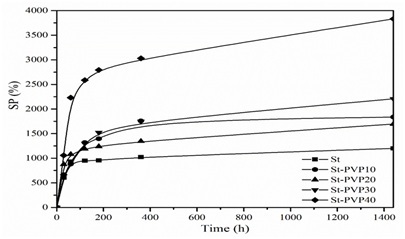 Figure 4 shows swelling kinetic curves extracted from starch and starch-based film samples. From these results, it can be observed that there is a growth in the amount of water absorbed by the material as a function of time, reaching equilibrium after 6hrs. During the initial stages, the solvent molecules come into contact with polymer chains, increasing its volume and mass. In this way, the presence of PVP increases the capacity of the films to absorb water significantly, expanding the hydrophilicity of the material. This is due to the presence of functional groups, capable of favouring the hydration process through the hydrogen bonds between the polymer network and water. As the proportion of PVP gets higher in the films, the water absorption capacity increases as shown in table 3. This behaviour occurs together with the polymer chemical structure, where the interaction between starch and PVP generates a three-dimensional network cross linked through hydrogen bonds by hydroxyl groups and through weak intermolecular interactions between the hydrophobic sides, due to the presence of C-H chains. This behaviour transforms the films into superabsorbent materials with a high swelling capacity reaching a value equal to 48% for 60/40 ratio. This is mainly influenced by the high solubility of PVP in water and the intermolecular interactions between the two polymers. The physical unions are those that favour the solubility of the material because of its affinity with the solvent, and therefore a smaller gel fraction is obtained (Table 3). Moreover, due to the loss of material in swelling tests, the solubility of the film samples was studied. Figure 4 shows solubility kinetic experiments for the films, which evidence behaviour similar to the observed one in the swelling experiments. The solubility increases considerably during the first hours of contact and stabilizes after 6hrs, almost reaching its equilibrium. An increase of solubility of the films was observed with the addition of PVP in the samples, showing values from 28% for St-PVP20 film reaching a 48% value for St-PVP40 film. This behaviour is mainly influenced by the high solubility of PVP in water, which is over the intermolecular interactions between St and PVP. Furthermore, a gel fraction was obtained and these results are reported in table 3. From the solubility and swelling results for films, it can be possible to note that the gel fraction for St-PVP10 is closed to the value for the starch film, reaching a lower loss of material by solubility with higher starch content. Nevertheless, a high proportion of PVP in the mixture favours its swelling, also generating a greater solubility in water. The incorporation of PVP in the sweet native corn starch matrix improved the physical properties of the starch in the developed films. The blends produced were compatible in a whole range of studied concentrations, which could be observed through the shift from the Tg values for PVP of the films starch-based to the Tg value for pure PVP. In general, SEM images showed less homogeneous films as incorporation of PVP increases in the films. The FT-IR analysis evidenced the PVP incorporation through the visualization of their characteristic bands and confirmed the interaction between the components by means of bands displacement capable to form strong interactions. These interactions resulted in improvements of the mechanical properties, where the resistance of the films was increased. Furthermore, the measurement of oxygen permeability for the films evidenced an expected behaviour of the barrier properties, which show a decrease in the values of the starch-based films because of the nature of the incorporated polymer. In this sense, the swelling and solubility tests showed an increase in these films. These results can be explained by the nature of the obtained final material, which involves films with hydrophilic characteristics. In this study, the incorporation of poly(N-vinyl-2-pyrrolidone) in different ratios in starch matrix resulted in an attractive final material, obtaining films with remarkable physical properties and an environmentally-friendly character. However, further research is necessary to verify their compatibility with real food and storage conditions. The authors acknowledge the financial support of Project USA 1555 of the University of Santiago De Chile, The Basal Financing Program for Scientific and Technological Centers of Excellence (Grant number FB0807). Piñeros-Hernandez D, Medina-Jaramillo C, López-Córdoba A, Goyanes S (2017) Edible cassava starch films carrying rosemary antioxidant extracts for potential use as active food packaging. Food Hydrocolloids 63: 488-495. Al-Hassan AA, Norziah MH (2012) Starch-gelatin edible films: Water vapor permeability and mechanical properties as affected by plasticizers. Food Hydrocolloids 26: 108-117. Nair SB, Alummoottil N, Moothandasserry S (2017) Chitosan-konjac glucomannan-cassava starch-nanosilver composite films with moisture resistant and antimicrobial properties for food-packaging applications. Starch 69: 1-2. Soto D, Urdaneta J, Pernía K, León O, Muñoz-Bonilla A, et al. (2016) Removal of heavy metal ions in water by starch esters. Starch 68: 37-46. Guilbert S, Gontard N, Gorris LGM (1996) Prolongation of the shelf-life of perishable food products using biodegradable films and coatings. LWT - Food Science and Technology 29: 10-17. Priya B, Gupta VK, Pathania D, Singha AS (2014) Synthesis, characterization and antibacterial activity of biodegradable starch/PVA composite films reinforced with cellulosic fibre. Carbohydrate Polymers 109: 171-179. 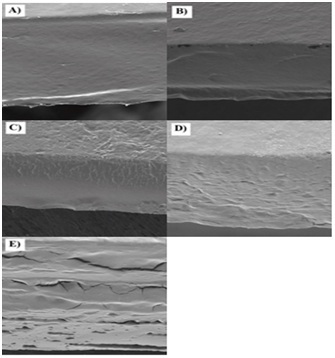 Oromiehie AR, Lari TT, Rabiee A (2013) Physical and thermal mechanical properties of corn starch/LDPE composites. Journal of Applied Polymer Science 127: 1128-1134. Kaushi A, Singh M, Verma G (2010) Green nanocomposites based on thermoplastic starch and steam exploded cellulose nanofibrils from wheat straw. Carbohydrate Polymers 82: 337-345. Ke T, Sun XS (2003) Starch, poly(lactic acid) and poly(vinyl alcohol) blends. Journal of Polymers and the Environment 11: 7-14. Podshivalov A, Zakharova M, Glazacheva E, Uspenskaya M (2017) Gelatin/potato starch edible biocomposite films: Correlation between morphology and physical properties. Carbohydrate Polymers 157: 1162-1172. Rompothi O, Pradipasena P, Tananuwong K, Somwangthanaroj A, Janjarasskul T (2017) Development of non-water soluble, ductile mung bean starch based edible film with oxygen barrier and heat sealability. Carbohydr Polym 157: 748-756. Jiménez A, Fabra MJ, Talens P, Chiralt A (2012) Edible and biodegradable starch films: A review. Food and Bioprocess Technology 5: 2058-2076. Mali S, Grossmann MVE, García MA, Martino MN, Zaritzky NE (2006) Effects of controlled storage on thermal, mechanical and barrier properties of plasticized films from different starch sources. Journal of Food Engineering 75: 453-460. El-Houssiny AS, Ward AAM, Mansour SH, Abd- El- Messieh SL (2012) Biodegradable blends based on polyvinyl pyrrolidone for insulation purposes. Journal of Applied Polymer Science 124: 3879-3891. Mutalik V, Manjeshwar LS, Wali A, Sairam M, Sreedhar B, et al. (2007) Aqueous-solution and solid-film properties of poly(vinyl alcohol), poly(vinyl pyrrolidone), gelatin, starch, and carboxymethylcellulose polymers. Applied Polymer Science 106: 765-774. Devi DA, Smitha B, Sridhar S, Aminabhavi TM (2006) Novel crosslinked chitosan/poly(vinylpyrrolidone) blend membranes for dehydrating tetrahydrofuran by the pervaporation technique. Journal of Membrane Science 280: 45-53. Li J, Zivanovic S, Davidson PM, Kit K (2010) Characterization and comparison of chitosan/PVP and chitosan/PEO blend films. Carbohydrate Polymers 79: 786-791. Nešic A, Ružic J, Gordic M, Ostojic S, Micic D, et al. (2017) Pectin-polyvinylpyrrolidone films: A sustainable approach to the development of biobased packaging materials. Composites Part B: Engineering 110: 56-61. Takeda C, Takeda Y, Hizukuri S (1983) Physicochemical properties of lily starch. Cereal Chem 60: 212-216. Fabra MJ, Martínez-Sanz M, Gómez-Mascaraque LG, Gavara R, López-Rubio A (2018) Structural and physicochemical characterization of thermoplastic corn starch films containing microalgae. Carbohydr Polym 186: 184-191. Gaudin S, Lourdin D, Forssell PM, Colonna P (2000) Antiplasticisation and oxygen permeability of starch-sorbitol films. Carbohydrate Polymers 43: 33-37. Yoon SD (2014) Cross-linked potato starch-based blend films using ascorbic acid as a plasticizer. Journal of Agricultural and Food Chemistry 62: 1755-1764. Alvarado N, Romero J, Torres A, López de Dicastillo C, Rojas A, et al. (2018) Supercritical impregnation of thymol in poly(lactic acid) filled with electrospun poly(vinyl alcohol)-cellulose nanocrystals nanofibers: Development an active food packaging material. Journal of Food Engineering 217: 1-10. Alvarado N, Fuentes I, Alegría L, Sandoval C, Leiva A, et al. (2015) Interactions in blends of dendronized polymeric nanocomposites with some common drugs. Journal of Applied Polymer Science 132: 42450. Müller P, Bere J, Fekete E, Móczó J, Nagy B, et al. (2016) Interactions, structure and properties in PLA/plasticized starch blends. Polymer 103: 9-18. Sen F, Uzunsoy I, Basturka E, Kahraman MV (2017) Antimicrobial agent-free hybrid cationic starch/sodium alginate polyelectrolyte films for food packaging materials. Carbohydrate Polymers 170: 264-270. Tiana H, Yan J, Rajulu AV, Xiang A, Luo X (2017) Fabrication and properties of polyvinyl alcohol/starch blend films: Effect of composition and humidity. International Journal of Biological Macromolecules 96: 518-523. Pal S, Mal D, Singh RP (2005) Cationic starch: An effective flocculating agent. Carbohydrate Polymers 59: 417-423. Kizil R, Irudayaraj J, Seetharamanj K (2002) Characterization of irradiated starches by using FT-raman and FTIR spectroscopy. Journal of Agricultural and Food Chemistry 50: 3912-3918. Garcia NL, Famá L, Dufresne A, Aranguren M, Goyanes S (2009) A comparison between the physico-chemical properties of tuber and cereal starches. Food Research International 42: 976-982. Gutiérrez TJ, Morales NJ, Pérez E, Tapia MS, Famá L (2015) Physico-chemical properties of edible films derived from native and phosphatedcush-cush yam and cassava starches. Food Packaging and Shelf Life 3: 1-8. Medina Jaramillo C, Gutiérrez TJ, Goyanes S, Bernal C, Famá L (2016) Biodegradability and plasticizing effect of yerba mate extract oncassava starch edible films. Carbohydr Polym 151: 150-159. 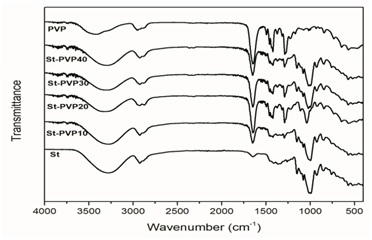 Du YK, Yang P, Mou ZG, Hua NP, Jiang L (2006) Thermal decomposition behaviors of PVP coated on platinum nanoparticles. Journal of Applied Polymer Science 99: 23-26. Hamad K, Kaseem M, Deri F, Ko YG (2016) Mechanical properties and compatibility of polylactic acid/polystyrene polymer blend. Materials Letters 164: 409-412. Hezma AM, Elashmawi IS, Rajeh A, Kamal M (2016) Change spectroscopic, thermal and mechanical studies of PU/PVC blends. Physica B: Condensed Matter 495: 4-10. Jape SP, Deshpande VD (2017) Nonisothermal crystallization kinetics of nylon 66/LCP blends. Thermochimica Acta 655: 1-12. Khaparde D (2017) Preparation and prediction of physical properties of cellulose acetate and polyamide polymer blend. Carbohydrate Polymers 173: 338-343. Forssell P, Lahtinen R, Lahelin M, Myllärinen P (2002) Oxygen permeability of amylose and amylopectin films. Carbohydrate Polymers 47: 125-129. Ortega-Toro R, Jiménez A, Talens P, Chiralt A (2014) Effect of the incorporation of surfactants on the physical properties of corn starch films. Food Hydrocolloids 38: 66-75. Balti R, Mansour MB, Sayari N, Yacoubi L, Rabaoui L, et al. (2017) Development and characterization of bioactive edible films from spider crab (Maja crispata) chitosan incorporated with spirulina extract. Int J Biol Macromol 105: 1464-1472. Hu D, Wang H, Wang L (2016) Physical properties and antibacterial activity of quaternized chitosan/carboxymethyl cellulose blend films. LWT-Food Science and Technology 65: 398-405. Kurek M, Galus S, Debeaufort F (2014) Surface, mechanical and barrier properties of bio-based composite films based on chitosan and whey protein. Food Packaging and Shelf Life 1: 56-67. Sung SH, Chang Y, Han J (2017) Development of polylactic acid nanocomposite films reinforced withcellulose nanocrystals derived from coffee silverskin. Carbohydrate Polymers 169: 495-503. Miller KS, Krochta JM (1997) Oxygen and aroma barrier properties of edible films: A review. Trends in Food Science &Technology 8: 228-237. Liu Z, Dong Y, Men H, Jiang M, Tong Jin, et al. (2012) Post-crosslinking modification of thermoplastic starch/PVA blend films by using sodium hexametaphosphate. Carbohydrate Polymers 89: 473-477. Figure 1: FTIR spectra of St, PVP and St-based developed films. Figure 2: SEM images of St and St-based films. A) St; B) St-PVP10; C) St-PVP20; D) St-PVP30; E) St-PVP40. Figure 3: DTGA curve obtained for St, PVP and St-based films under nitrogen. Figure 4: Swelling kinetics of St-PVP films. Table 1: Tg values and mechanical properties of developed St and St-based films. Note: Superscript means in each column with different superscript letters are significantly different (p<0.05). Table 2: Oxygen permeability values obtained for St and St-based films. Note: Means in each row with different superscript letters are significantly different (p<0.05). Table 3: Swelling and solubility in water for St and St-based films. Note: Means in each column with different superscript letters are significantly different (p<0.05). Citation: Alvarado N, Urdaneta J, Figueroa JRR, de Dicastillo CL, Schmidt M, et al. (2018) Improvement of Physicochemical Properties of Starch Films by Blending it with Poly(N-Vinyl-2-Pyrrolidone). J Food Sci Nut 4: 036. Copyright: © 2018 Alvarado N, et al., This is an open-access article distributed under the terms of the Creative Commons Attribution License, which permits unrestricted use, distribution, and reproduction in any medium, provided the original author and source are credited.